Senior tours are a fantastic way to spend fun, relaxing, and educational time for mature travellers who want to enjoy life and leave the troublesome planning to other people. Escorted tours offer stays at the best hotels and meals at the best of restaurants, as well as visits to castles, palaces, and monuments of great cultural, historical, and religious value. Through this experience, the guests are led by educated and friendly guides. Among numerous tours, the most interesting might be custom made tours to Eastern Europe, as well as the exclusive spring/fall tours to Israel. A two-week tour to Israel offers the travellers a life-enriching experience unique to this country. Some of the places people can visit while touring this country are: Tel Aviv, Jerusalem, Safed, Caesarea, Kibbutz Misgav Am, Haifa, Golan Heights, Beit She’an, Beit Alpha, Masada, and the Dead Sea. Israel’s capital is home to the largest concentration of Bauhaus buildings in the world, as well as 500 synagogues and to the Independence Hall. For taste of art, travellers can go to the Old Port of Jaffa, filled with artists’ quarters and galleries, or to the trendy, historical neighbourhood of Neve Tzedek in Jaffa. Every Friday and Tuesday, visitors can enjoy a craft fair, Nachalat Binyamin. Jerusalem is a city of many wonders. One ought to visit Yad Vashem, the holocaust memorial and museum, where they can see the Children’s Memorial and Garden of the Righteous Among the Nations. For exquisite pieces of art, visitors should see the exhibitions in the Israel Museum. The Shrine of the Book houses the Dead Sea Scrolls and The Holyland Model of Jerusalem. Other places to explore include: the invincible Hurva Synagogue, the Old City, Tower of David Museum, Arab Market in the Old City, and Mount Zion, the highest point of ancient Jerusalem where King David was buried. Finally, a visit to the Kotel is a must, with a note to place in this sacred wall, followed by a tour of the Western Wall Tunnel located under the Old City. Safed is the highest city in Israel and the centre of Kabbalah. Here, people can visit the most important synagogues, such as the 16th century Abuhav Synagogue, then take a walk through the Old Town and the famous Artists’ Quarter. A wonderful way to spend a day in Israel is to take a drive along the coast towards the first capital of Judea under the Romans. Travellers can visit the excavations of the Crusader city and the Roman port, aqueduct, even the amphitheatre that has been restored to its former glory and is now a concert venue. A tour of Israel would not be complete without the visit to its most northern kibbutz, situated on a peak overlooking the Upper Galilee. Visitors can tour the Kibbutz, enjoy the panoramic view, and learn about the events that shaped the lives in the Upper Galilee. Haifa is Israel’s third largest city, set on the slopes of Mount Carmel and facing the Mediterranean Sea. 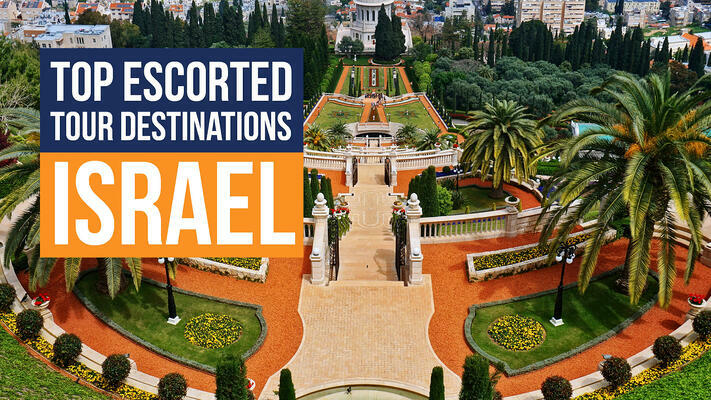 If one enjoys spectacular views, they ought to visit the summit of Mount Carmel in Haifa. Here, a panoramic view of the Haifa Bay and Western Galilee awaits all travellers. People can see the golden domed Baha’i Shrine and exotic Persian Gardens. Also, visitors can take a ride or a walk around the city, and enjoy its cultural sites. For a unique experience, one ought to visit the Golan Heights. Here, visitors can discover, first-hand, the strategic importance of the area by climbing the Golan Heights to see the former Syrian bunker. At the same time, they can experience the magnificent view of the expansive Hula Valley. Visitors might also want to take a ride around the Hula Nature Reserve, which is home to beautiful and serene nature, and a major stopover for migrating birds, with an estimated 500 million of them passing through the valley each year. Beit She’an, also known as “Scythopolis”, is the largest archaeological park in Israel. One can witness history by observing the magnificent excavations from Roman and Byzantine periods. Just a drive away is Beit Alpha where the sightseeing of ancient artefacts continues. Here, the visitors can see the beautiful mosaic floor of a synagogue from the Byzantine period. What a better way to finish an entertaining and educational tour than a trip to Masada – an ancient fortress on a massive plateau overlooking the Dead Sea. Travellers can ascend by cable car and tour the ancient fortress, visit the remains of the walls, the synagogue, King Herod's Palace, and the Roman-style bath house with mosaic floors. For a perfect ending, one can proceed to the Dead Sea, observe the fascinating landscape, then enjoy the hotel facilities, such as the Dead Sea mud, pools, and sulphur and spa treatments.